Don Babcock is a member of the managing board of the Northwest Indiana Forum and director of economic development for the Northern Indiana Public Service Co. (NIPSO) in Merrillville. Competition compels us to excel—that is the nature of free enterprise—but competition between individuals alone will not often produce meaningful change across an entire region. Cooperation, respect and teamwork are required to create a vibrant, enticing, community of like-minded individuals who are out to change the world. People visiting or even passing through Northwest Indiana often wonder how there could be so many amazing assets concentrated along the 45 miles of shoreline just east of Chicago. Northwest Indiana is truly a natural wonder created by Lake Michigan. And men over the centuries have built roads, rail and industries that created powerful economies that expanded and contracted depending on national and international markets and the effectiveness of local leadership. Unfortunately, since the late 1970s Northwest Indiana has simply not lived up to its potential. Well, all that is about to change due to a new commitment to regionalism and mutual success. The Northwest Indiana Forum is leading a bold, new initiative that will literally “Ignite the Region.” Throughout most of 2018, the forum along with our regional partners, municipalities and businesses, spent countless hours crafting a Regional Economic Development Plan. This plan promises to give a platform to transform the seven-county Region to the next level. Reading through Ignite the Region: Northwest Indiana’s Strategy for Economic Transformation, you will see a play book of action-oriented, regional initiatives that will attract investment and talent at a more rapid pace. Ignite the Region is a starting point to build upon the great work already happening in our area. We cannot fix all the problems and challenges facing the Region right off the bat, but we can embark on a journey with a broad and inclusive group of leaders to make meaningful, sustainable change. Our leadership team is committed to the hard work and thoughtful planning that will continue to propel us forward. To that end, we are committed to reporting our progress each year to the broad community as we march forward. We wholeheartedly encourage others to join us in creating a place known for being inviting and creating hope and opportunity for all. Northwest Indiana drives its vibrant and inclusive communities by creating the most dynamic economic environment of the Midwest, fueled by innovation, diversity and talent. 1. Business development and marketing: Promote robust and sustainable growth by engaging in a proactive, economic development program that supports business retention, expansion, creation and attraction. 2. Entrepreneurship and innovation: Foster robust entrepreneurship and innovation ecosystems to propel future economic growth. 3. Infrastructure: Ensure that Northwest Indiana’s infrastructure meets the needs of a 21st-century economy. 4. Talent: Expand the talent assets of Northwest Indiana and strengthen connections to the Region’s employers. 5. Place making: Create the amenities and places that enhance Northwest Indiana’s appeal to diverse groups of people. To learn more, visit www.nwiforum.org/economic-initiative. Don is a graduate of Purdue University Calumet in Hammond with a degree in engineering and an MBA from University of Chicago. 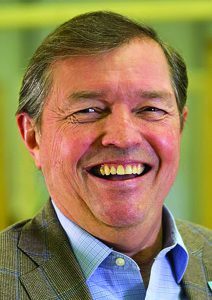 He has 30 years of experience with Northern Indiana Public Service Co. and is involved with many of the utility’s projects and initiatives, not only across northern Indiana, but elsewhere in Indiana and across the country. Don is one of Indiana’s biggest boosters and has accompanied the governor on overseas trade missions several times.